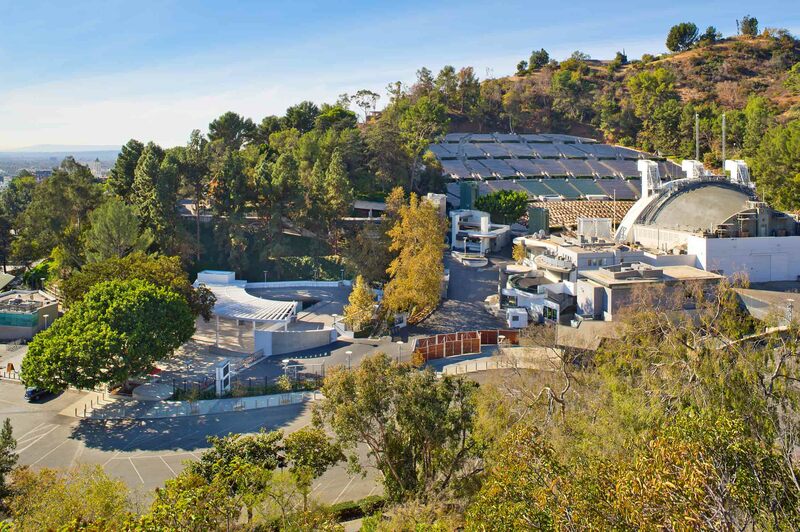 The legendary Hollywood Bowl is an outdoor amphitheater constructed in 1929 within a County of Los Angeles Park in the heart of Hollywood. 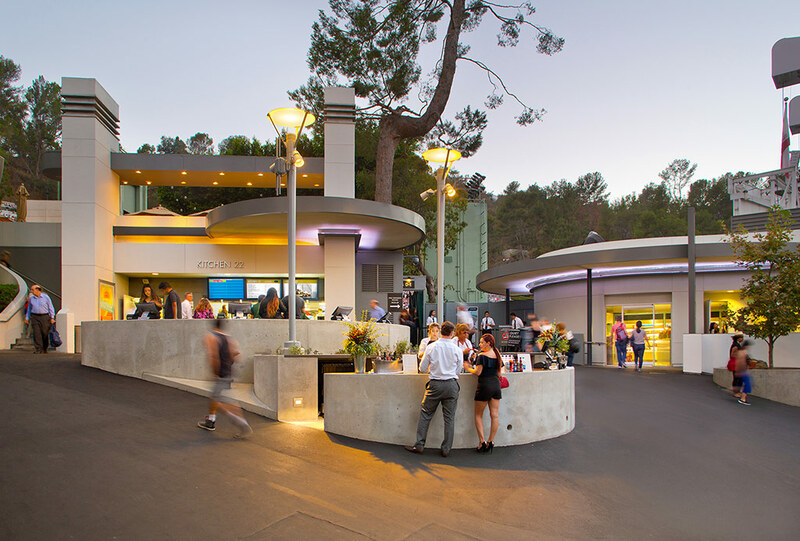 Over the last decade, Rios Clementi Hale Studios has worked with the LA Philharmonic, who operates the Hollywood Bowl, to create a comprehensive patron experience. Each element builds on the others to create an experience far greater than the sum of the parts. 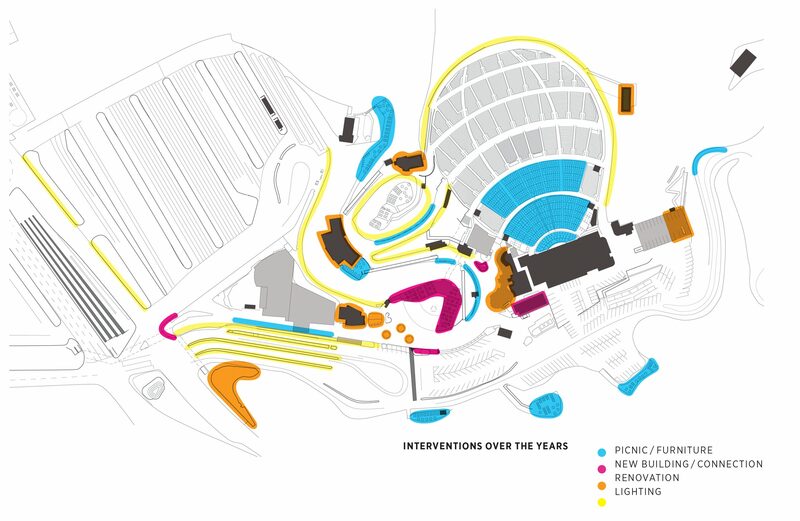 At an essential level, each project is focused on improving the experience of patrons through the core elements of their facility: the historic fountain (2007); restrooms (2011); park lighting (2013); picnic furniture, dining (2012); box seating, market, and food service improvements (2015); the artist lounge (2014); a new box office plaza with gift shop (LA Phil Store), market, ticketing area, and store branding package, along with a security gate and mid-gate security building (2016). In 2015, we were asked to create a new Box Office Plaza in time for the 2017 summer season. 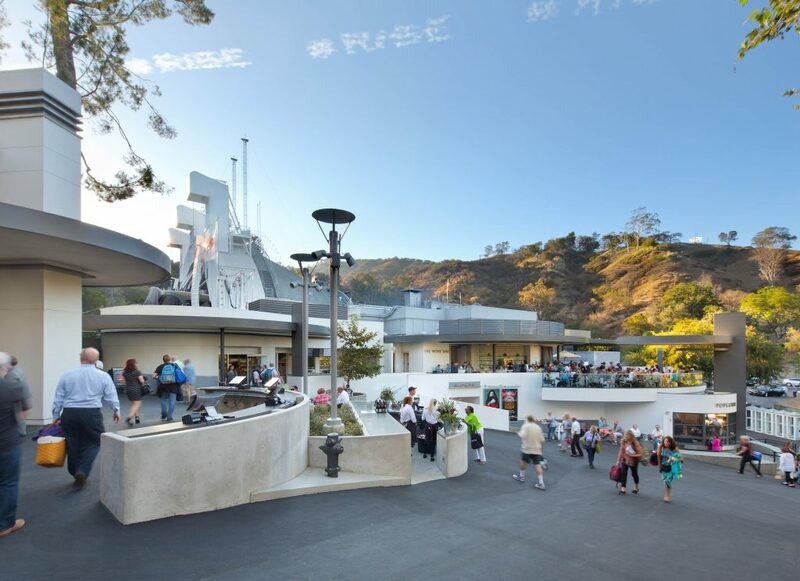 The new structure creates a grand entrance plaza at the box office that dramatically changes the way visitors inhabit the space. The entry celebrates arrival and builds excitement for the experience to come. 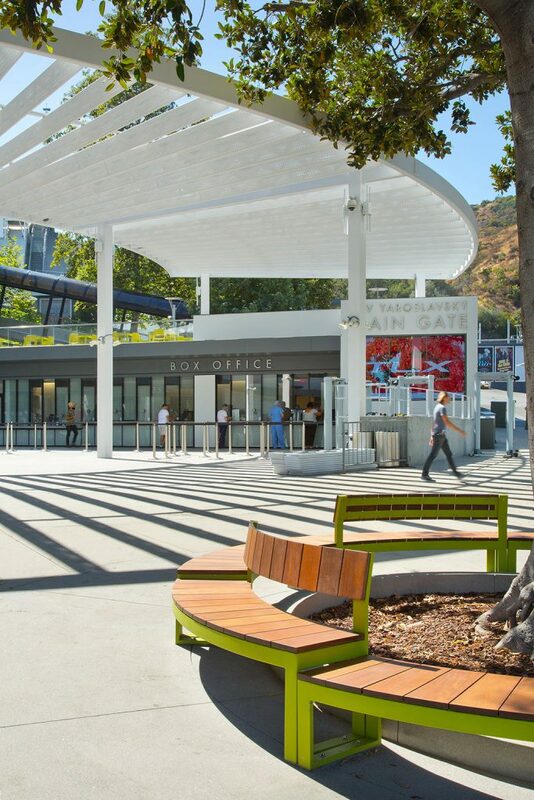 The semicircular trellis shading element above the plaza recalls the original box office building design by Welton Beckett, which incorporated a trellis and a series of circular shapes. 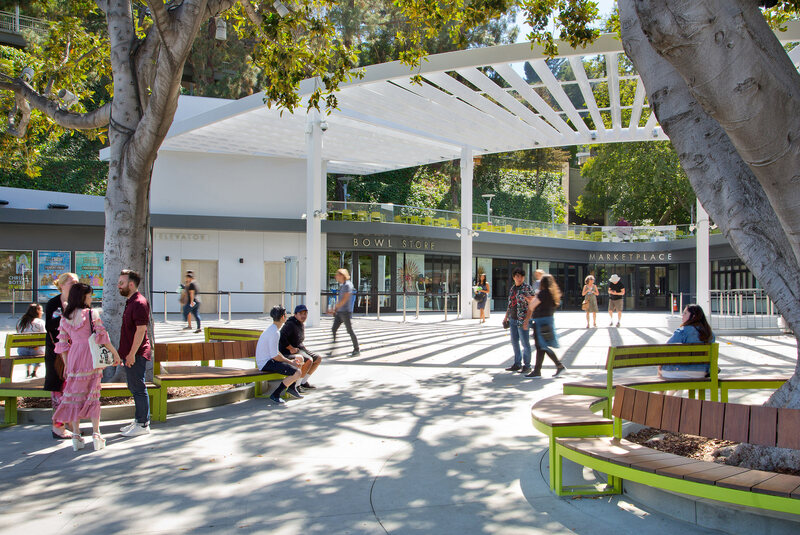 New circular pavers surround the round benches and tables that RCH Studios previously designed for the Bowl in 2012, carrying the motif all the way to the ground. 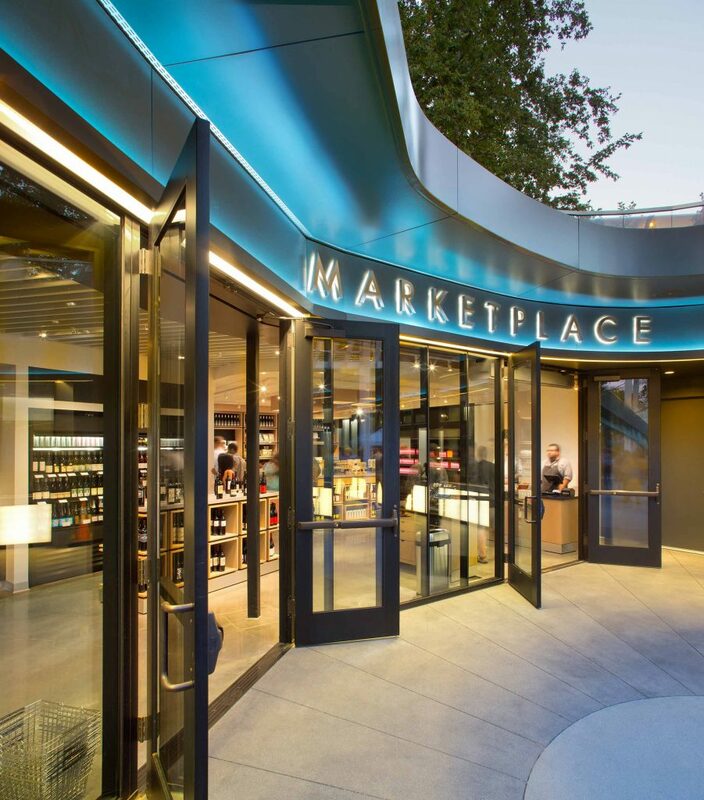 Moving the elevators from the center of the box office plaza to its edges opened up more rooftop space above the store and market, which expanded a prime picnicking spot. 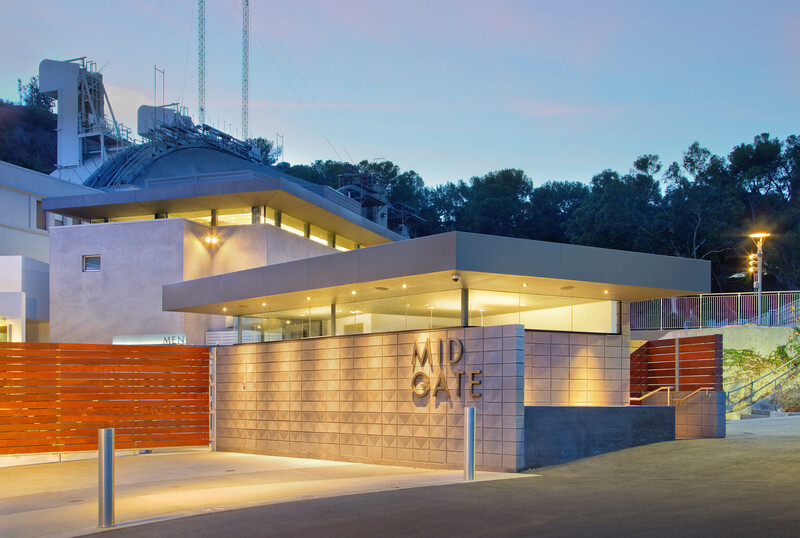 To reduce crowding at the Bowl’s main entrance, we moved first aid and security functions to a more prominent location, and erected an additional entry gate (the Mid Gate) in their place halfway up the frontage road. 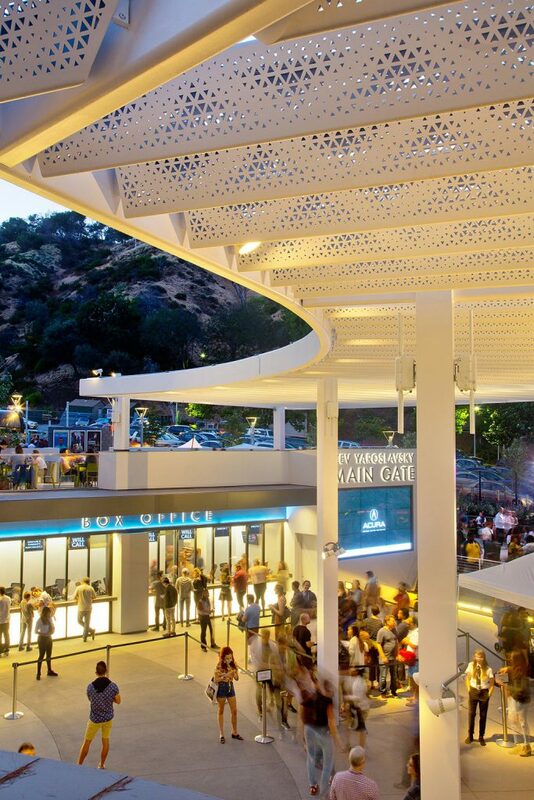 The gate’s elevated roof and water-jet-cut aluminum screen tie contiguously with our 2014 reimagining of the Bowl’s Artist Lounge. 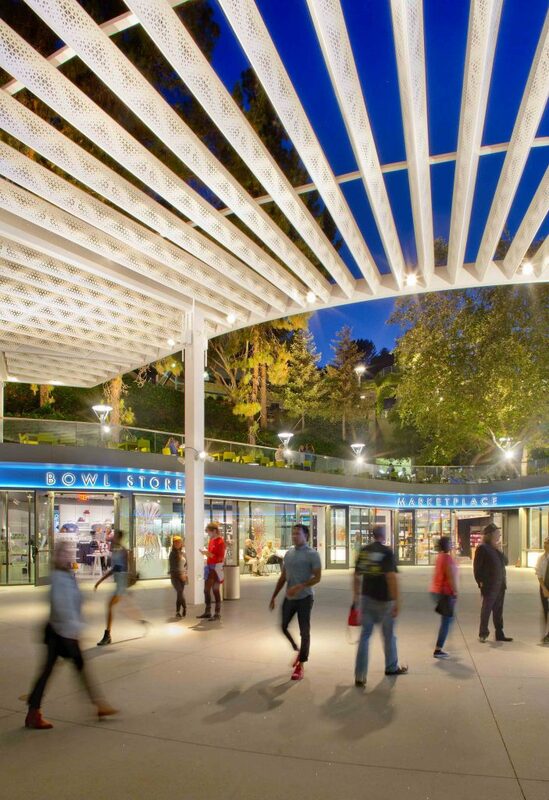 The new entry experience represents a streamlined, modern Hollywood Bowl that retains its historic character. 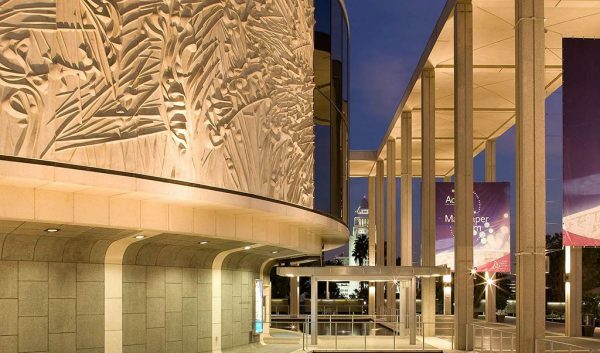 Within the new plaza, we renovated the box office to provide a better guest experience and added a marketplace run by The Luques Group, along with a new LA Phil Store. During the 2014 off-season, we renovated the “temporary” 15-year-old Philharmonic Artist Lounge, a former women’s restroom, into private lounge space that visually connects to the park and shields the artists from curious onlookers. 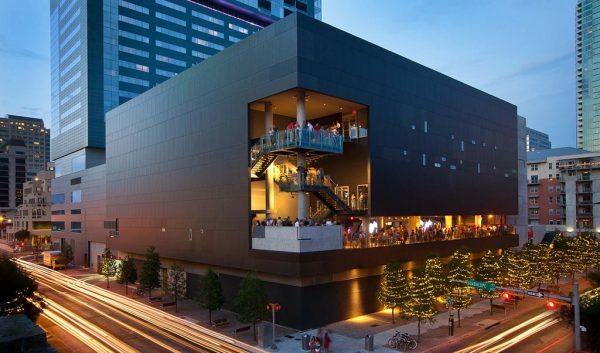 To create a permanent and monumental space we literally “raised the roof.” By adding new steel structure within the existing masonry shell to create a new structure, the interior became tall, day-lit, and airy, and most importantly it felt like an important ceremonial space that celebrates the artists. Within the lounge, clerestory windows paired with punched openings frame views of the surrounding hillside. 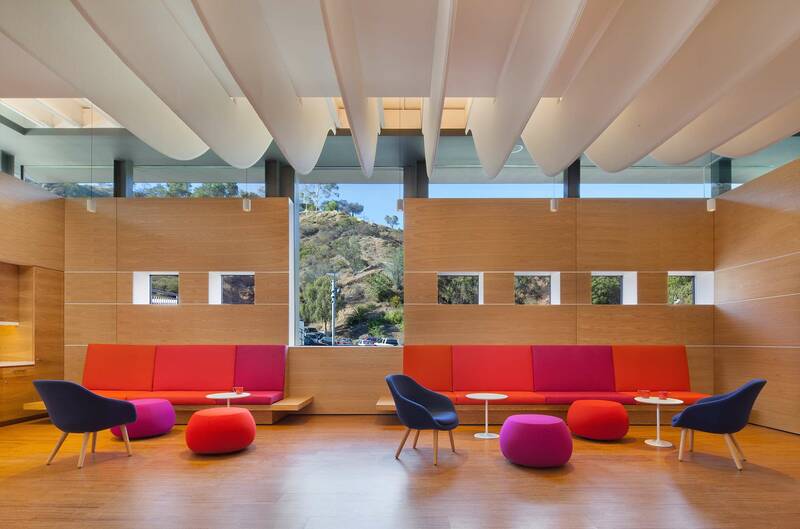 A series of acoustical felt panels arrayed on the underbelly of the exposed roof beams turn the ceiling into a sculptural piece that unifies the entire space. The splayed curvature of the panels in a repetitive series is a dynamic homage to the iconic scalloped and layered shell of the stage. On the exterior, a decorative aluminum scrim on the exterior façade conceals a myriad of pipes, conduit, and equipment that were added over the years. The screen features a water-jet cut pattern of bars that mimic the rising and falling shape of sound indicators of a recording volume display. 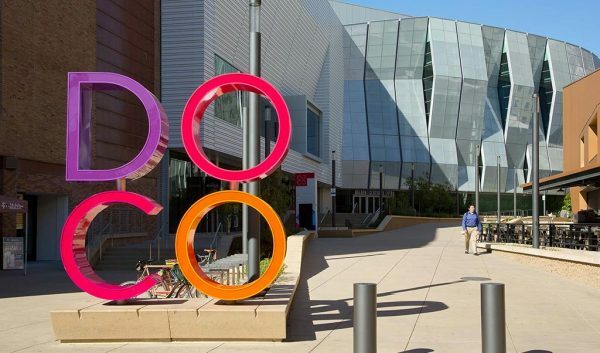 In 2013, we worked with Lightswitch to upgrade the Bowl’s lighting elements to showcase the surrounding natural environment and provide theatrical effects outside of the performance area. 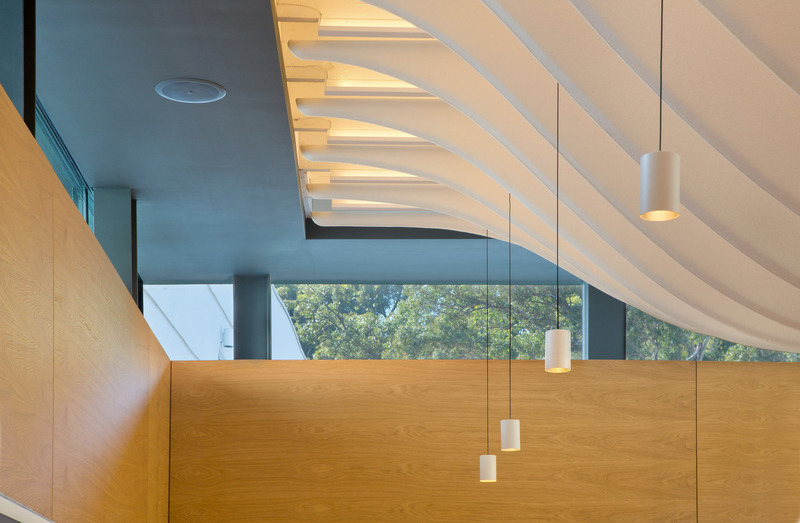 The design utilized a modern, energy-efficient LED Selux pole fixture that met the Bowl’s stylistic guidelines while creating a consistent look and quality of light. By removing poles in areas where lights could be hung discreetly from the trees, we enhanced the venue’s natural look, simultaneously adding light poles in areas that were previously too dark. 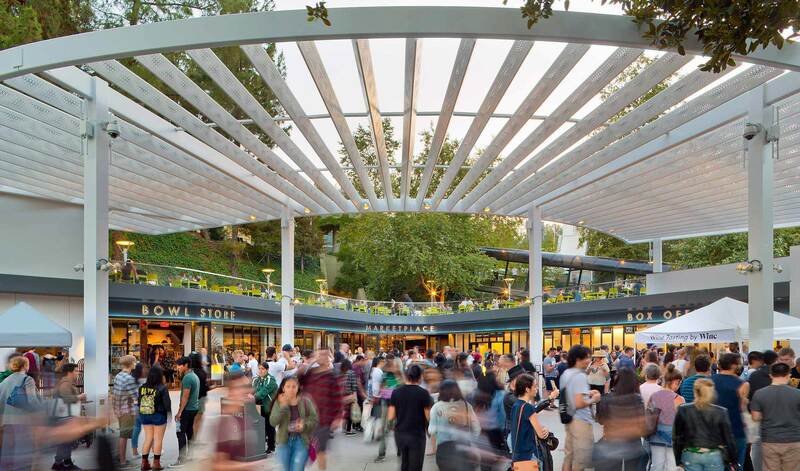 The lighting design spotlights the majesty of the Bowl’s large heritage trees as well as the most impressive trees lining the park-like pathways to and from the amphitheater. To complete the lighting design, we added landscape lights around the entire perimeter of the seating area, illuminating the surrounding hillsides that make the Bowl such a unique space. One of the unique experiences of the Bowl, its topography around the site and terraces down to the grand stage, is also its greatest challenge. However, picnicking is an integral and storied part of the Bowl experience in order to unwind and socialize before a performance, so how do you solve the dilemma of eating on a hill? 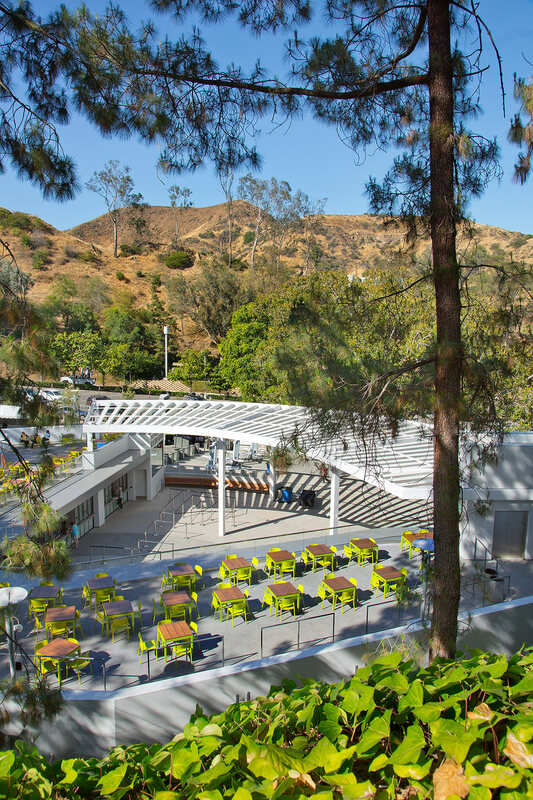 Our design customized a variety of picnic furnishings to adapt to the gentle hillside slopes creating many places for patrons to gather prior to performances. 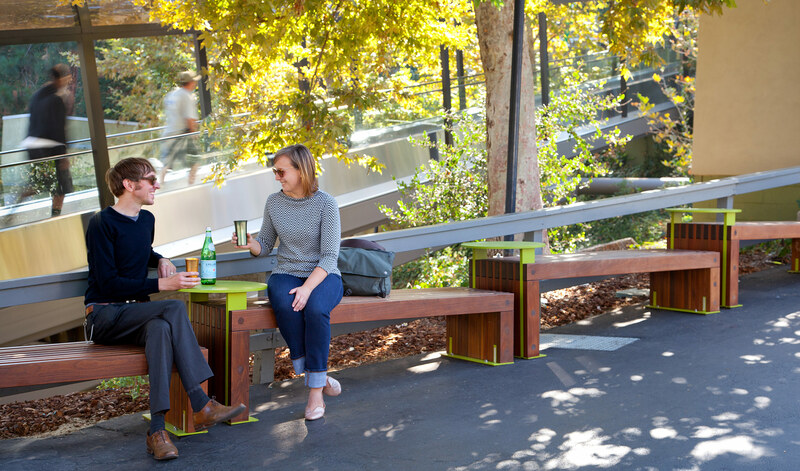 Ranging from large picnic tables to stepped benches with sides tables, the furniture accommodates all types of picnics, from full meals to a quick drink. 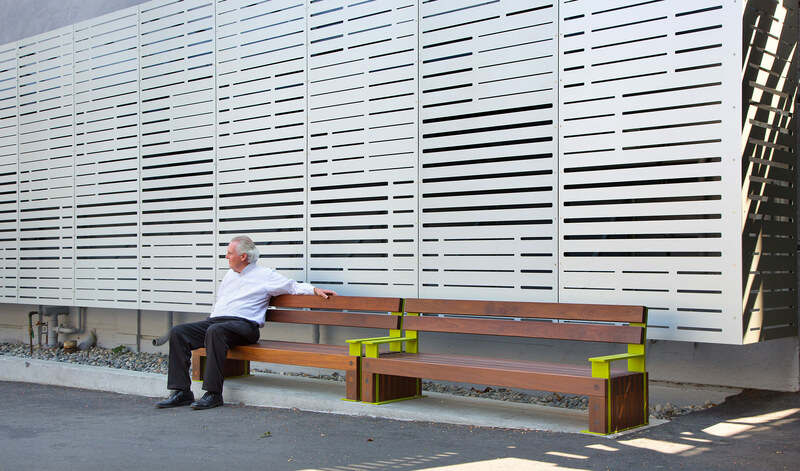 in a wide variety of configurations to create a joyful appearance. 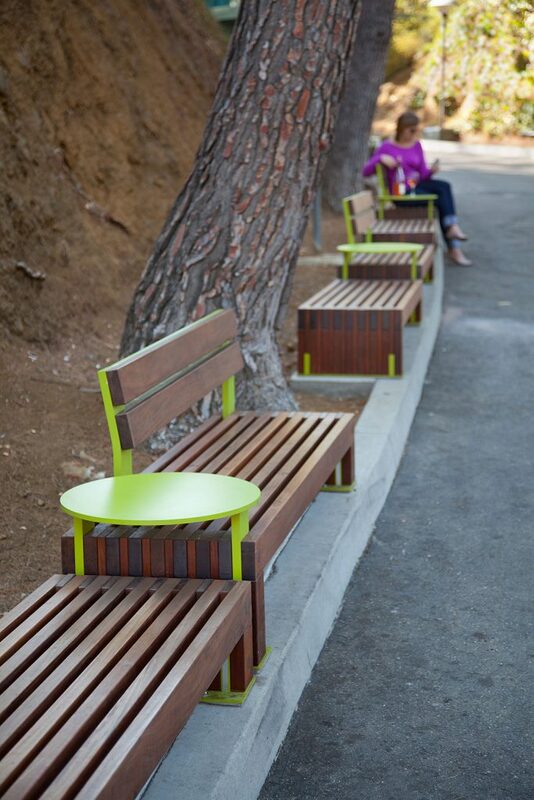 Round green tables use integrated wood bench tops, while rectangular wood tables and benches are supported by green legs. 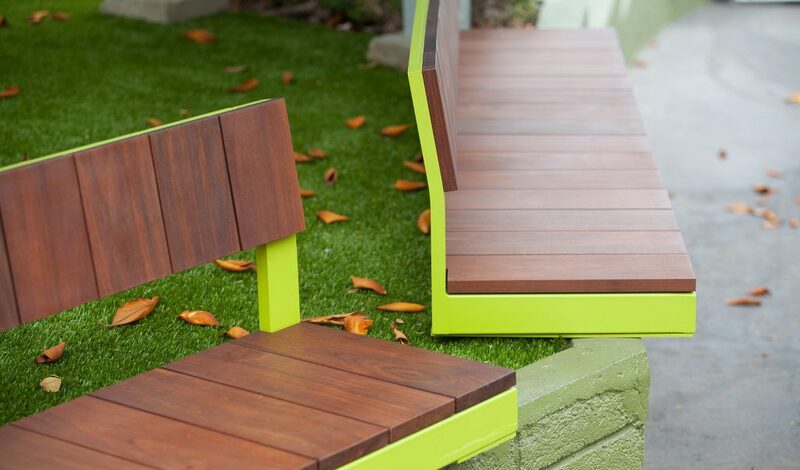 Square and rectangular wood-topped tables are matched with free-standing chairs in the vibrant green. 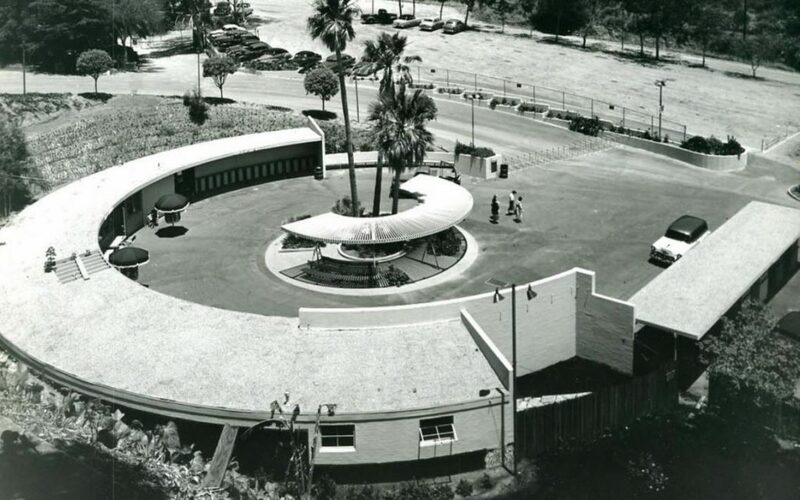 In 2011, we renovated the Bowl’s 14 restrooms, which had only experienced minor improvements during the previous 30 years. Our primary goal was to integrate the restrooms seamlessly into the park environment, while giving them a festive evening vibe. We used graphics to improve wayfinding and flow to previously hidden facilities, which had the overall impact of reducing lines. 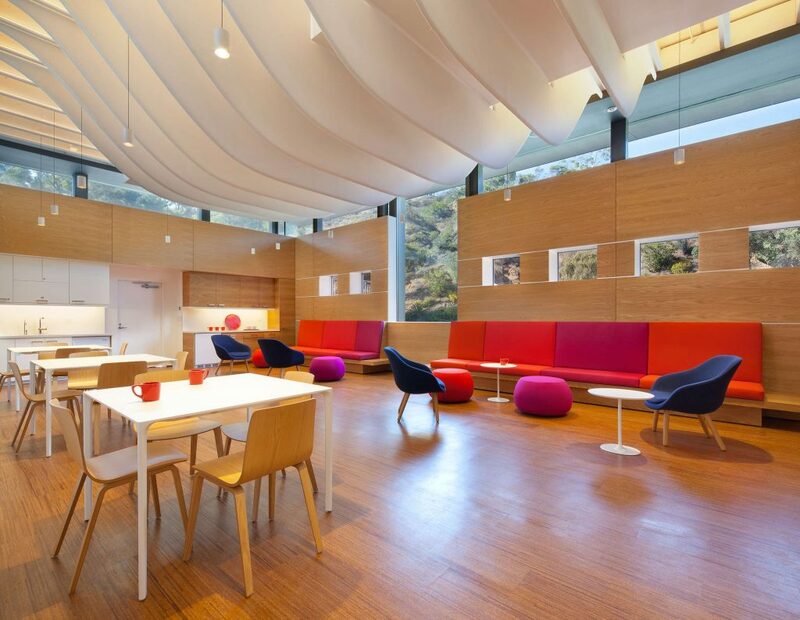 The sweeping curvilinear shapes aid in directing patrons toward empty stalls and large circular mirrors extend views within the space. The floor of each restroom was painted a shade of green that was color matched to the Toyon tree (Heteromeles arbutifolia), a plant native to Southern California and found in the hillside surrounding the Bowl. 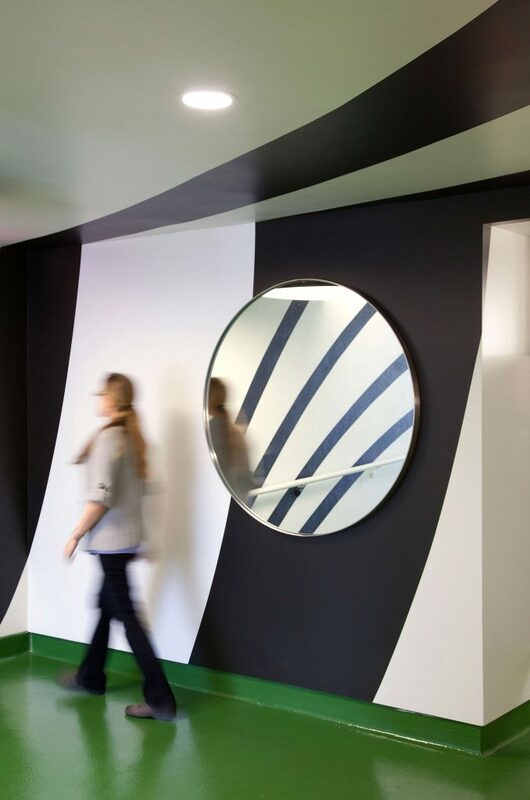 The fresh, clean green and white color palette plays an important role in leading people in from the outside and helps define the extents of the restroom. When we renovated the historic fountain in 2007, we restored it to working condition for the first time in 30 years. Designed and built in 1940 by sculptor George Stanley (the designer of the Oscar statuette), three venerable sculptors carved it from 300 tons of granite. 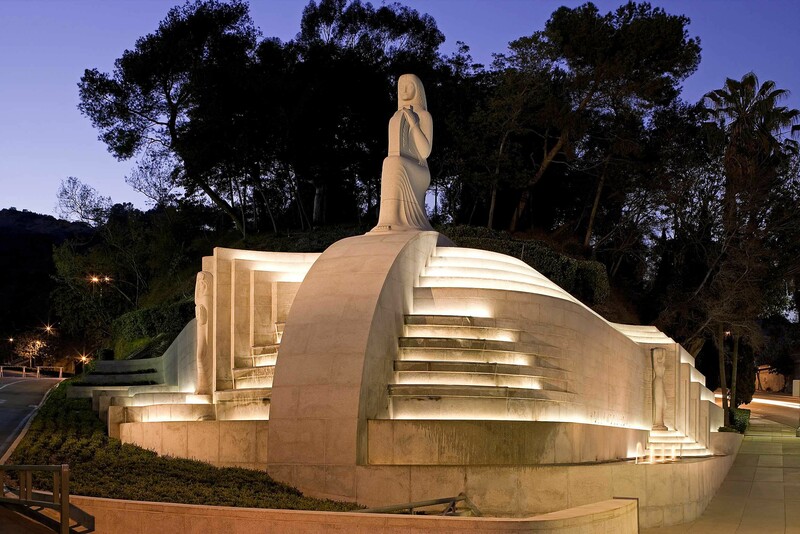 The cleaned and re-grouted fountain, featuring new electrical, plumbing, and lighting, once again shines a light on the Muses of Drama and Dance flanking the kneeling Muse of Music.